Many of the pirate games on this page have been graciously submitted by visitors like yourself. If you’ve got any cool ideas to add just scroll to the bottom of the page and share them with us, Thanks! Tick tock, find the croc. With a little imagination, an egg timer makes a suitable crocodile (remember Peter Pan? the ticking crocodile…) Have pirates (the kids) try to locate the hidden croc by its tick, before the bell rings. This is one of the classic pirate games. It’s extremely fun and interactive! The kids love it…. You can get a complete treasure hunt activity set, or put one together on your own. You can make up practically anything for clues. 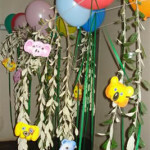 Here’s an idea that’ll suit a group of different ages – use nursery rhymes for the clues. For example, the first clue can be: “The itsy, bitsy __________ climbed up the __________ _________. Spider and Water Spout are the clues. Once they figure this out, the next clue can be hidden (taped to the bottom of) a rubber black spider taped on the gutter in your back yard or on some sort of water spout. Another clue can be Jack & Jill went up a hill to fetch a _______ __ ______. The next clue can be floating in a vile in a pail of water. Another idea for a clue can be: Mary Mary quite contrary, how does your ________ grow? Hide this clue in your garden. Get the idea? At the end of the hunt, find an interesting place marked with a large X to hide a treasure chest filled with a goodie box with each kids name on it. This way the kids won’t all be grabbing for the loot, while the little kids get nothing. Draw a treasure map with details such as palm trees, lakes and animals. Tear the edges to age and if you really want an authentic look burn the edges briefly and stain the map with tea bags. Decide where the treasure is and mark it with a red “X” on the BACK of the map. Make little X’s and ask the children to put them on the map where they think the treasure is (having written their name on each X). Take the map and hold it up against a window or bulb to reveal the X that is on the back and where the treasure is! Here’s one of those really funny pirate games – Prepare ahead of time brightly-colored plastic drink cups (16 oz or large enough to fit a kid’s hand into) and cut an X hole in the bottom. Then push a wrapped candy cane halfway down into it. Voila! A pirate’s prosthesis! Now empty a large bag of pretzels into a bowl. Let’s see how many pretzels the kids can fish out with their “hooks” in 60 seconds. Take a long thick board and mount each side on bricks or books (if you want more of an effect, and you don’t have a real pool in your backyard, take a kiddie pool and put it underneath the plank. Have inflatable alligators swim in it and that’s your alligator pit.) The older kids can be blindfolded and see who can “walk the plank” without falling into the “alligator pit”. Other kid pirates can have squirt bottles and can be instructed to squirt the plank walker if they touch the ground. If you decide that your group of kids is likely to be overly excited and you don’t want them to possibly hurt themselves, you can also draw a plank on a sidewalk with chalk and have the kids walk inside the lines. Hang cored apples at the kids height. Then the kids have to bite the apple with their hands behind their backs. It’s a simple and classic game, but the kids love this sort of pirate games. If you don’t have a sandbox, take a kiddie pool and put sand in it. Then take pebbles and spray paint them gold and bury them in the sand. Prepare foil pie plates with holes punched in the bottoms for the kids to sift through the sand for the “Gold”. First of all you need two cardboard boxes, one for each team. Each team is made up of two people, one sits in the box, and the other pushes the box. On the mark of “GO”, the person standing on both teams pushes the “ship” (while the other team member is sitting in the box). They race down the fake stream till they get to the end and then the team members switch places and race back down the fake stream. The first team to get back is the winning team. You can have multiple races until you get to the number one winning team. Have some sort of prize for the winners. Fun game with the same rules as “Pin the Tail on the Donkey”. Draw a pirate on posterboard and make parrots out of construction paper. 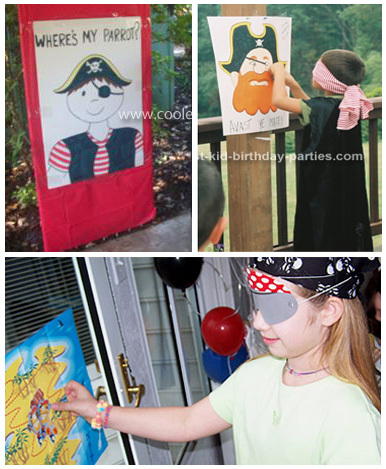 A bandana for a blindfold and have each child try to pin the parrot on the shoulder of the pirate. Fun game, the kids loved it! Most of the kids will want to sword fight like the real pirates, so here’s a safe solution! Set the stage for a duel. You can have the birthday kid and a guest start, while the others watch and anxiously wait their turn to “do battle”. Each kid is given a breadstick for a sword and the object of the game is to break your opponent’s breadstick without breaking your own; when you have nothing left but a stump you must surrender and the next challenger steps up. The person who stays the champ the longest is the winner. (Something you should tell the kids beforehand: that they are only allowed to hit the other person’s breadstick, if any other body part gets hit the person is disqualified!). Here’s one of those classic Pirate games. You’ll need: A stuffed parrot and pirate music in a music player you can stop randomly (played similar to Hot Potato). Gather kids in a circle and pass the Pirate’s parrot around while the music is playing. When the music stops the person with the parrot is out. Stop the music randomly to keep the game lively. Continue until there is only one person left that hasn’t held the Pirate’s parrot.